It's almost Halloween! 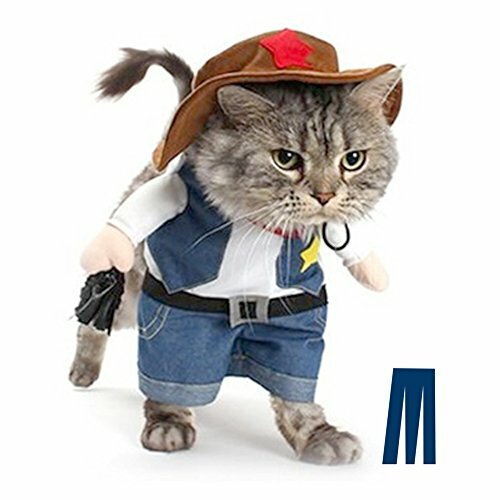 The cat would look super cute in a costume! 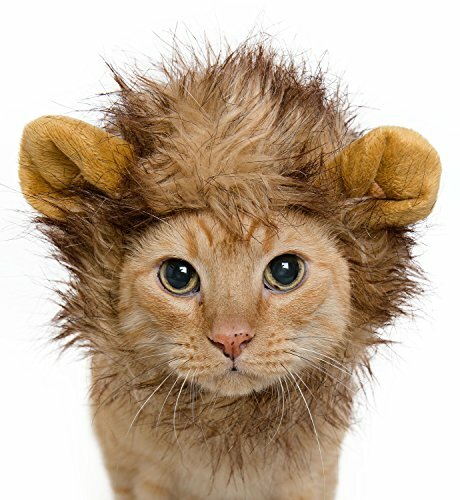 ​Is It Okay for cats to wear Halloween costumes? If he reacts ​and is in obvious discomfort you need to be there to remove the costume. It is impossible not to smile, in a tortured sort of way, looking at these kitties Some of them are just downright funny and others are cuteness personified. 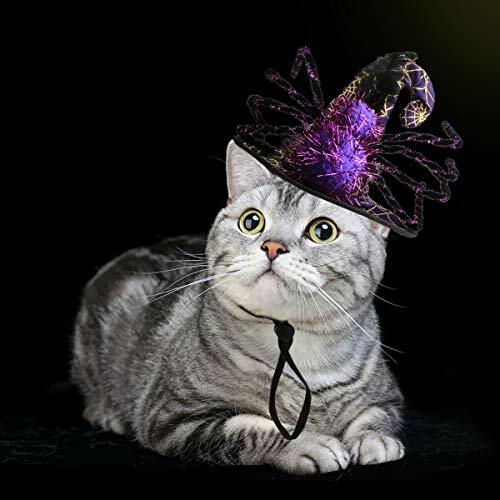 PS - We would love to see a photo of your kitty glammed up in his/her Halloween costume. Be quick, the costume may not be on for too long. Include kitties name and any other useful information. The photos will be added to the end of this post. A lion's mane is obviously going to be flattering for kitty. They do come in different colours so even if you have a white cat there is a lion's mane to suit your kitty. After all we need to have a color coordinated lion's mane. 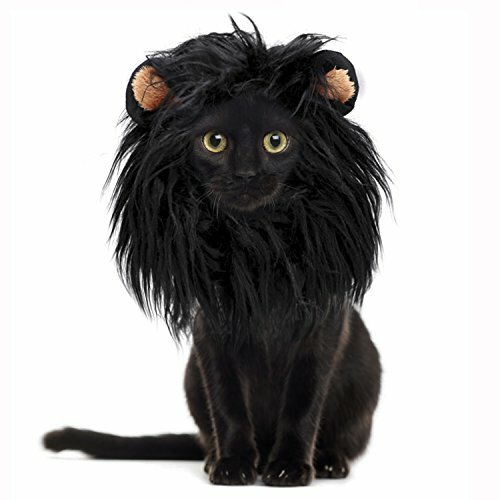 Lion Mane Costume for Cats & Dogs – Free Feathered Catnip Toy Included – Cute Halloween Pet Costume. 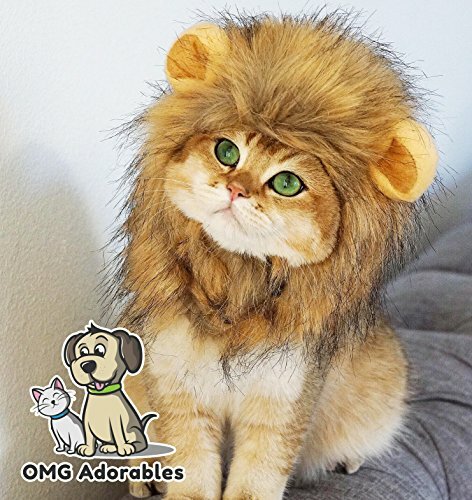 ​This is cute and is a good fit because this lion's mane has a Velcro strip making it adjustable and quick to put on and take off. Even the most placid kitty is not going to like too much shenanigans, so the quicker it can go on and off the better. The mane is suitable for most cats weighing up to 15 lbs. A portion of the price you pay for this costume goes to an animal shelter in New Orleans and you also receive a free feathered catnip toy for the cat. The neck measurement suits 9.5" - 14", although I am guessing not too many of us know the neck measurement of our cat. It is made to fit adult cats and small dogs, not kittens. The mane is full and bushy as can be seen in the photo and has the look of real fur. After packaging it may require some fluffing up and a bit of zhooshing to get the full mane effect. The fabric is lightweight which is perfect for the cat. It is a mixture of polyester and cotton and easily pulls over the head. ​It definitely fits the bill for looking like a lion's mane. What makes this mane different from the others? For a start it comes in two sizes and it is available in ​three colors. The mane pictured here is black however it is also available in white and brown. That just about covers all bases. Even though this is a fairly new item it has received positive feedback regarding quality. This product can be washed by machine or hand. If washing in the machine I would recommend using a laundry bag. The mane is fairly long compared to some other manes to replicate (proportionally) the length of a lion’s mane. We have chosen the three manes we judged to be the best, based on ease of getting on and off the cat, looking like an actual lion's mane and the quality of the mane. However, mane beauty is in the eye of the beholder 🙂 and you may be looking for a mane that is a little different to the ones we chosen. We have selected some more mane offerings that you may prefer. You need a sense of humor for this costume because it is just meant to be fun. 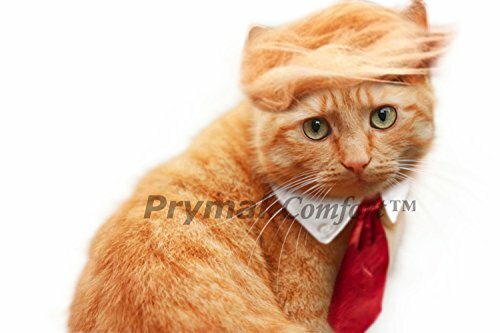 It comes with the territory that you will have to allow your cat to be the boss ​when in costume. To color coordinate it will looks its finest on a ginger cat or a cat with ginger markings. The hairpiece fits with elastic under the chin. The collar and tie are secured with Velcro so this is an easy on and off costume. The fit is for an average size cat or small dog but approximately 10 or 11 lbs is a size guide for a comfortable fit. 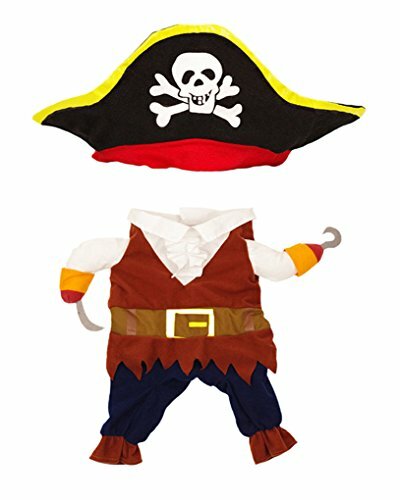 This pirate costume looks as cute as pie on cats. ​This ​view is from the back . ​The attention to detail is what makes it really stand out. The measurements given are quite specific as this costume does really need to fit. It would be worth taking the time to take the measurements before ordering. It is made from soft cotton so it is comfortable and washable. Whether you cat finds it comfortable is something that will be a mystery until you give it a go. The closures are Velcro so a plus for ease of getting an and taking off. There are four different sizes so careful measuring is necessary. The headgear/hats/ capes types of costumes are not quite as specific regarding measuring. ​It is not the weight of your cat that is important it is the actual measurements. There is some adjustment possible with the Velcro closures. The fabric is polyester so soft and comfortable. The body of the costume is one piece and the hat is separate. 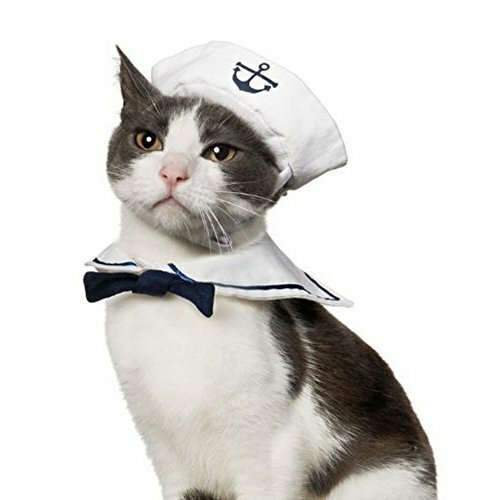 This includes a hat and a sailor collar with a tie. This extraordinarily cute and we would all hope that our kitty would be looking just like the kitty in the picture. There is one size and it allows for some adjustment. 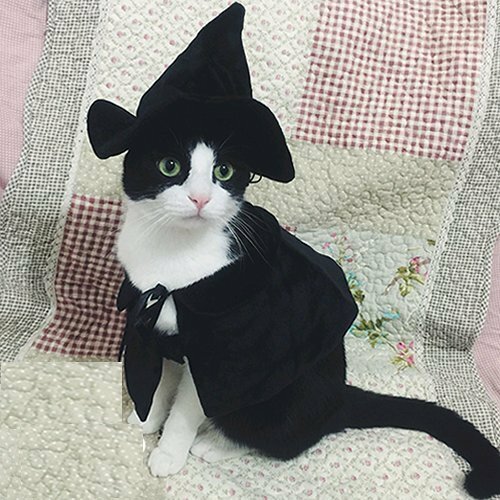 This is a super little costume transforming your cat into a witch or a wizard in seconds. It is a plush material so not irritating for the cat. The package includes one hat and one cloak. The hat has a drawstring so that the size can be altered to suit. It comes in two different sizes. Small/medium: Measurements: back length 13", neck girth 11-14", chest girth 18- 20" Medium Size: Measurements: back length 16", neck girth 16-20", chest girth 24- 28"
It is recommended that this costume be hand washed. That should take all of about two minutes. However it is worth taking care of something you have paid for. It is surprising how often you find a need for a costume or can lend one to someone else. ​The purple and black color scheme really do fulfill the wizard/witch​ theme. This gorgeously decorated little hat secures under the chin with a toggle so it's up to you how secure it needs to be. The hat itself is 4.7 inches (12cm) high and the width from the edge of the brim is 6.5 inches (16.5 cm). The adjustable toggle means that it is suitable for a range of cats and small dogs. It is plush and lush and completely gorgeous​. Purple is the definitely the preferred color scheme of witches/wizards and this hat is no exception. This hat is purple with a black wide adjustable strap which secures under the chin. 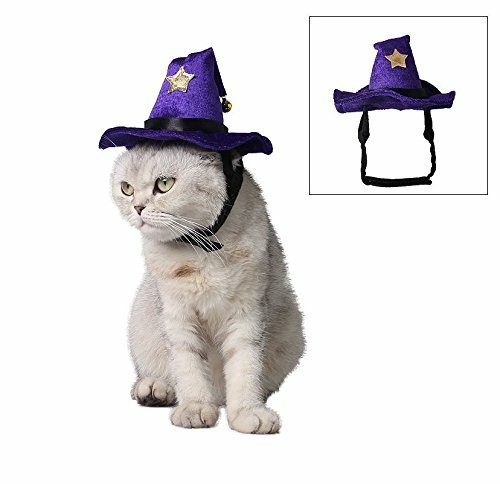 The strap does divide into two around the ear section so that there is some allowance for kitty ears to be not hindered too much be wearing this hat. This is just noticeable in the photo. The strap is wide so will be more comfortable than a cord closure. It is adjustable. The size given is 9.44"-13.38"/24-34cm. The seller also states that may be some a 1 to 2 cm difference in the actual measurements of the hat. The height of the hat is approximately 3.5 inches (9 cm) measured from the brim to where the hat folds over at the top. It is a decorative hat featuring a gold star on the front and a bell on the tip of the hat. 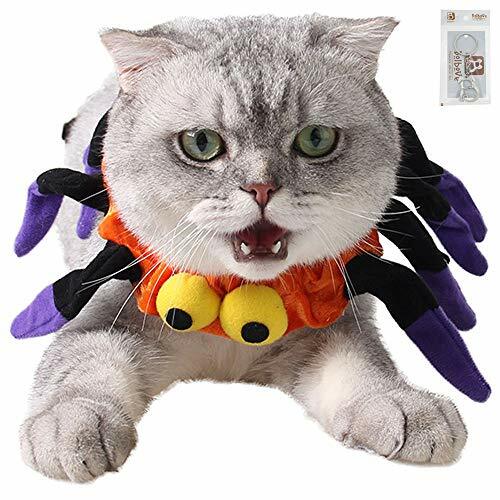 ​​I don't know how kitty feels about having a spider around his neck but he won't know if you don't tell him. The whole costume just slides over the head in one go so easy on and easy off. It fits a neck girth girth from 9.5" to 11.5" I would be erring on the side of caution here and going for a fit that is one the loose side rather than the tight side. It is soft and easily wearable. ​The design of this hat is clever. It is not a standalone hat as such - the actual hat secures under the chin however it has a section of fabric at the back that extends from under the brim down to the neck.It is not noticeable from the front of the photo. ​The strap to secure the headgear is adjust able and ties. It fits a neck girth from 10.2" to 11.8"
​Both of these accessories also come with a key chain. 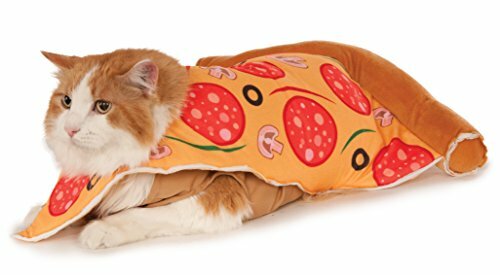 What can you say about a pizza costume for a cat? It is super cool, very funny and will certainly get attention. It is a clever design as the body is a jumpsuit which has a Velcro fastening at the neck. The pizza slice is attached to the jumpsuit. It comes in four different sizes however the small and medium sizes will suit cats. Small is 11 inches from neck to tail, chest 17 inches and neck 12 inches. Medium is 15 inches from neck to tail, chest 20 inches and neck 15.5 inches. Obviously these sizes are going to be somewhat arbitrary. As a rough guide size, medium fits a 12 to 15 lb cat without being constricting. 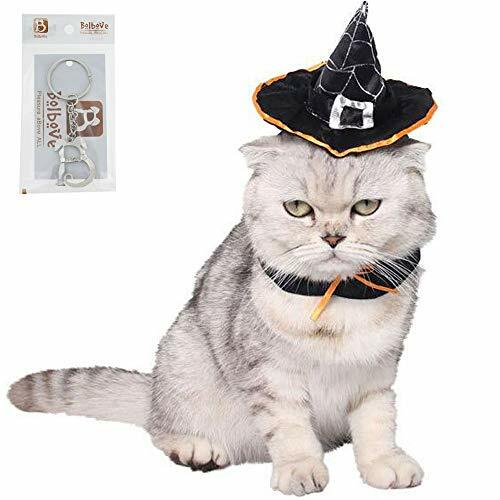 ​Almost without fail people who purchase these costumes do so for fun, knowing that it is quite possible the cat will not tolerate the costume idea for too long. We would love to see any photos of your cat dressed up so please contact us if you would like your cat to be included in the photo gallery.